Portable and easy to carry.Mini LED nightlight, good for camping, desktop lighting. Adopting the high technology, show excellent performance.This mini emergency light will brighten your life anytime and anywhere. Double-sided USB design, both of sides can be used as plug.Just plug IT into any USB port and use the bulb for Reading or task lighting. 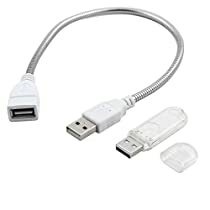 Compatible Device: USB device / power bank / mobile charger / computer / laptop.